This is the first in a series of articles meant to inform European film professionals of what European films are opening theatrically in the United States. The series is meant to generate information that will be useful to European filmmakers, distributors, financial institutions and film buffs. Since North America represents the largest market for European films outside of Europe itself, and is a bellwether for the performance of films in other territories, this information is, hopefully, of particular interest. For the first week of April, several European films that opened in the past few months continue to show strength in the marketplace. Chief among these are The Diving Bell And The Butterfly, Julian Schnabel’s adaptation of the best-selling memoir of Jean-Dominique Bauby. The film, which is being distributed in North America by Miramax Films, opened in limited release at the end of November 2007 and took advantage of various nominations for the film and its director during the past few months of release. So far, it has grossed over $6 million, last week placing it at the number 58 spot of the top 100 films, with 37 screens across the United States showing the film. At its height during Oscar season in February, the film could be seen on over 350 screens, a moderately wide release for an art film. Another Oscar-nominated French film, the animated memoir Persépolis has also held on for many weeks in theaters. 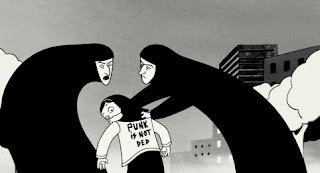 The film, an adaptation of Marjane Satrapi’s illustrated novel of her youth in Iran, opened in the US at the end of December 2007. In its 14 weeks of release, it has grossed just over US $4 million. This past week, it could be seen on 39 screens, placing a ranking of 61 in the top 100 grossers at the box office. At its height, during Oscar season in February, the film could be seen on over 500 screens across the country, an usually high number for a foreign-language film. The film’s distributor Sony Pictures Classics is about to release an English-language dubbed version next week, which would extend the film’s theatrical box office for another few months before it heads into DVD and television markets. A third Oscar-nominated French film, La Vie en Rose by Olivier Dahan, the biopic of French chanteuse Edith Piaf, has also had a very strong run, buoyed by the Oscar win by Marion Cotillard as Best Actress. The film opened on US screens back in June 2007 and has run continuously for the past 25 weeks, which is very impressive. Total box office has been over $10 Million, considered very strong for a foreign-language title. It is clearly ending its run, since it now is only on 12 screens nationwide, placing it at number 80 of the top 100 films. The film is expected to do well on DVD, with the music subject matter and the Oscar win for Cotillard its main assets. The film’s distributor in North America is Picturehouse. French films continue to be the strongest European films in the United States. In the past week or so, such films as Boarding Gate (Olivier Assayas), Love Songs (Christophe Honore), The Duchess of Langeais (Jacques Rivette) and Priceless (Pierre Salvadori) have opened to generally strong reviews in New York, the first stop for most foreign-language films, before they expand to other major cities in the United States with a strong community of interest (San Francisco, Los Angeles, Boston, Chicago, Seattle and Washington DC are among the strongest, with secondary markets in such cities as Miami, Atlanta, Philadelphia and Denver also strong). Films from the UK, because of the shared English language, are also high on the list of American releases, although that has slowed considerably in the past year. Currently, UK titles including Run Fat Boy Run (David Schwimmer), In Bruges (Martin McDonagh), The Bank Job (Roger Donaldson), Miss Pettigrew Lives For a Day (Bharat Nalluri), Flawless (Michael Radford), The Other Boleyn Girl (Justin Chadwick) and Irina Palm (Sam Garbaski) are beginning their national releases. The Bank Job, which has been marketed as a big-budget thriller rather than an art film, has done the best, grossing nearly $30 million since its release on 7 March. The film, distributed in the United States by Lionsgate, opened on 1600 screens nationwide, and remains on as many screens in its fifth week of release, ranking number 9 of the top 100, the most successful of all the European films in current distribution. The Other Boleyn Girl is a US/UK co-production distributed by Universal Pictures that has grossed a moderate $25 Million since its release at the end of February (a huge figure for an art film, but rather disappointing for a major release).